Bluehost is known in the web hosting industry as possibly the most popular and reliable WordPress hosting platform, and their reputation has been well deserved. Their shared plans are affordably priced, but their most popular WordPress hosting plans are actually pretty expensive compared to some of their competitors. Their main value-add is in their core team of WordPress developers and experts, which gives them the ability to offer top-notch customer support and troubleshoot complex problems unique to WordPress. Bluehost is a well established hosting solution that helps companies of different sizes get up and running online. With over a million domains under their wing, they offer a fantastic shared hosting plan at a cost effective price; this plan includes just about everything you need and more. If you are focusing on small-medium sized markets, you can enjoy Bluehost’s new customer yearly plans at a cost that beats the market. However, you will gain many benefits and discounts by taking out a longer term Pro plan, designed for larger organisations. It offers an unlimited number of websites, bandwidth, professional site backups, unlimited domains, email accounts and storage, as well as SLL, Dedicated IP’s, and a faster website load time. Want to know if Bluehost is right for you? Like many respectable web host companies, Bluehost offers limitless options, such as unlimited disk space and domain hosting, free drag and drop site builder, domains and emails. With no details on uptime guarantees, we rely on feedback from customer reviews, which show positive patterns. These reviews are positive about uptime and a common barometer for service puts them in a 99.9% range, something which they claim to achieve on the site. This in itself is a great positive point for potential new customers. The data centre is solid and robust, with UPS power backup, monitoring, solid server hardware and 10GB connections. This in layman terms mean you will experience fast servers, stable and secure, for high performance. Bluehost has been rated as the top hosting option on Top10BestWebHosting.com. 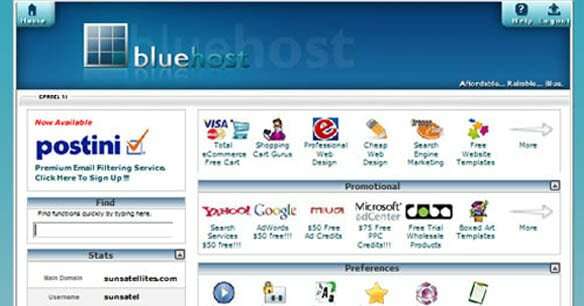 BlueHost uses cPanel, and this is excellent, as its interface has been tried by millions of users. 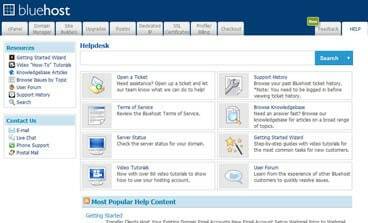 The panel itself is a set of tools that help to manage your web hosting, and administer one or several sites. Please note that many features of cPanel will require additional costs, so use the free cPanel trial by Bluehost before making the final choice. Bluehost prices are somewhat reasonable for the hosting industry, offering big discounts for subscription periods of one to three years. Any plan is refundable after 30 days. Their shared hosting plans successfully serve small-to-medium websites, while the more advanced dedicated or VPS hosting plans give you more resources, though with a substantial price hike. Other than the 30 day refund policy, Bluehost doesn’t provide any money back guarantee, which can be bothersome if you want to cancel long-term contracts. The registration procedure is transparent, so you can be sure you won’t be charged for extra features you did not know about. Bluehost offers affordable service for most webmasters, especially the intermediate users. Beginners might be lost in the configuration and have problems with customer service, while pros might need more CPU and other services that come with a more expensive price tag. If you know what you’re doing and what you need, Bluehost is a viable hosting option. Multiple ready one-click installs and a website builder will help you to create a new website from scratch. Moreover, you’ll get a bonus of $100 Google AdWords credit. In addition to this, you’ll get great hardware with perfect server performance and reliability, as well as many other exciting features. Like Bluehost Review? Visit Bluehost. Wondering how Bluehost stacks up against other Web Hosting companies? Enter any other Web Hosting company and we will give you a side-by-side comparison.